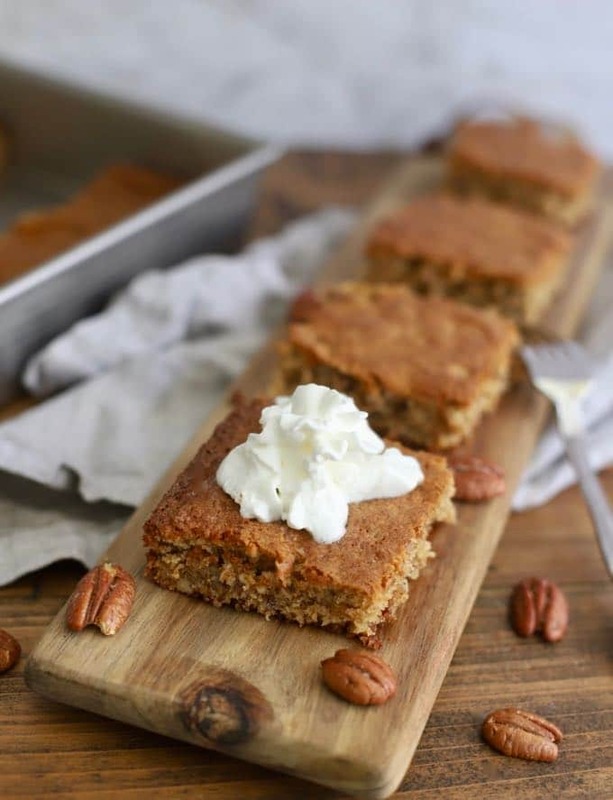 Georgia Cornbread Cake is a funny name for this simple, quirky, old-fashioned cake, which is much more like a pecan cake or pecan coffee cake. Contrary to its name, Georgia Cornbread Cake doesn’t contain any cornmeal, and I don’t think it tastes or even looks like cornbread. But what I will say is, this easy cake is absolutely delicious! My daughter shared this simple cake recipe with me, and I knew you would want it too! I made it a few days ago and watched the entire cake disappear in less than an hour. 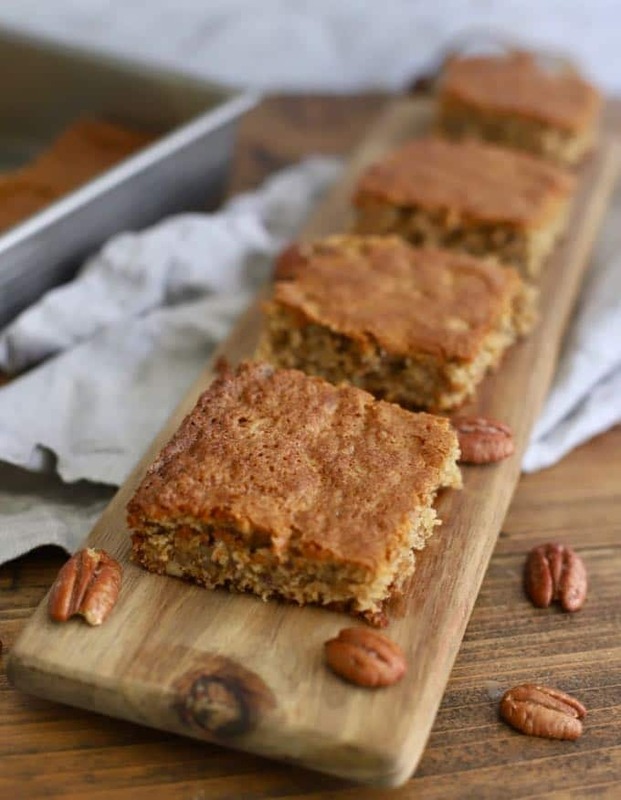 Georgia Cornbread Cake is perfect for an after-school snack for the kids, would go great with a cup of coffee or tea, and would also be a fun and easy dessert to take to a potluck or the beach. I personally like Georgia Cornbread Cake plain, but you could also serve it with a scoop of ice cream, a drizzle of caramel sauce, or even a dollop of whipped cream. But no matter how you serve it, your family will love its simplicity and taste! 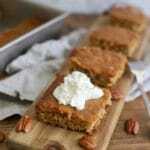 If you like simple desserts, you might also like these quick and easy recipes: Cranberry Cake with Hard Sauce, Gingerbread Cake with Cream Cheese Icing, Easy Pineapple Upside Down Cake, Southern Pecan Praline Cake, Easy Carrot Cake with Cream Cheese Icing, and Apple Dapple Cake with Caramel Glaze. Need more ideas, check out all of my Dessert Recipes here. Lightly grease and flour a 9×13 inch baking pan, or spray with non-stick baking spray with flour. 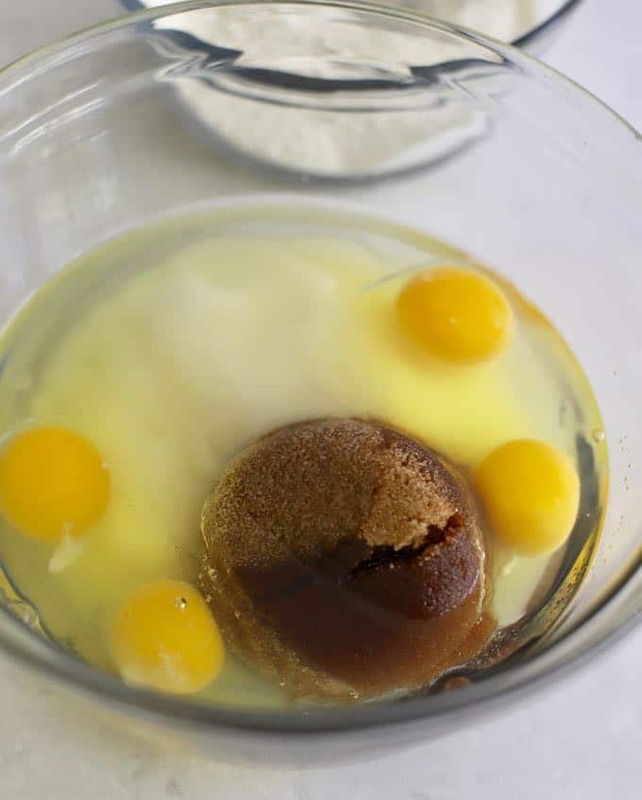 Add the sugars, eggs, vanilla, and vegetable oil to a large bowl and stir until combined. 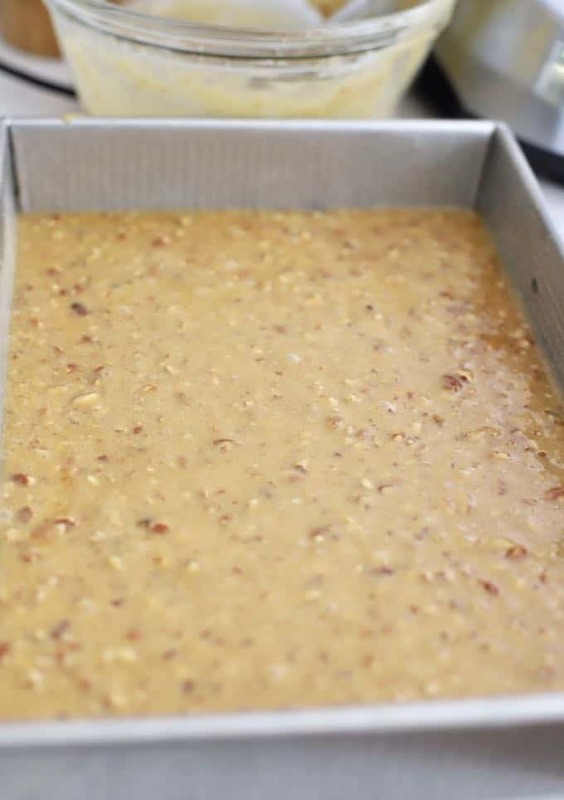 Add flour and pecans and stir until the batter is smooth. Pour the batter into the prepared pan and bake for 30-35 minutes. Cut into squares and serve plain or with a scoop of ice cream, a drizzle of caramel sauce, or a dollop of whipped cream. 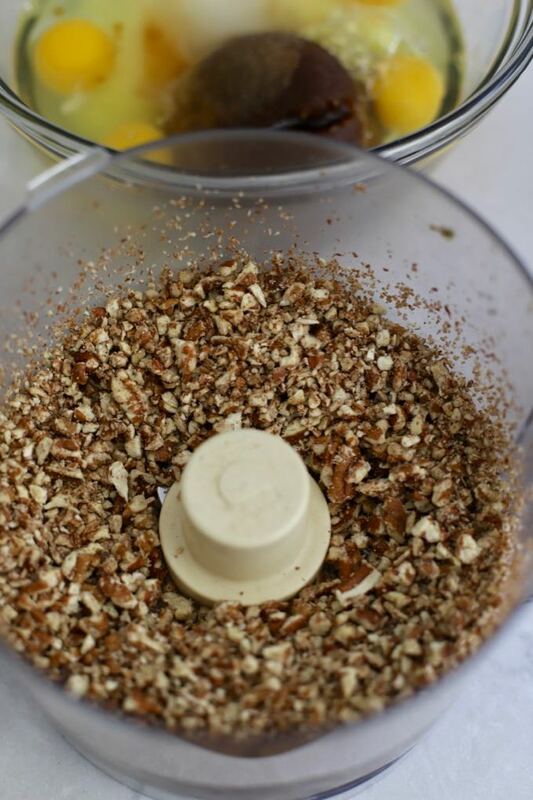 I used a food processor to chop my pecans and it only took a few seconds. However, you can also just chop them up using a knife. If you don’t have self-rising flour, simply add 1/2 teaspoon of salt and 2-1/4 teaspoons of baking powder to all-purpose flour and mix well. Please rate it and let me know what you think in the comments section. I love hearing from you and seeing what you have made! Thank you so much for visiting Grits and Pinecones! Come back soon! 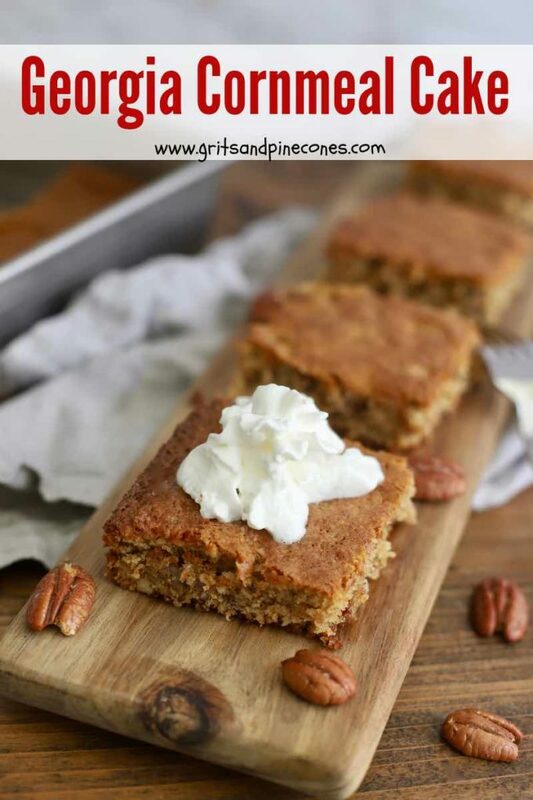 Georgia Cornbread Cake is a funny name for this simple, quirky, old-fashioned cake which is much more like a pecan cake or pecan coffee cake. Contrary to its name, Georgia Cornbread Cake doesn't contain any cornmeal, and I don't think it tastes or even looks like cornbread. Lightly grease and flour a 9x13 inch baking pan, or spray with non-stick baking spray with flour. If you don't have self-rising flour, simply add 1/2 teaspoon of salt and 2-1/4 teaspoons of baking powder to all-purpose flour and mix well. Hi Sharon! I’ve never heard of Georgie Cornbread Cake, but it sounds fantastic! Anything with pecans is a WIN in my estimation and anything from the South, well, is always good. So thanks again for sharing such great recipes.